You are at: Home / Agora / Will SYRIZA accept the proposal from Greece's lenders? Will SYRIZA accept the proposal from Greece's lenders? As Greece’s lenders prepare to present Prime Minister Alexis Tsipras with their final proposal, there is one question that everyone wants the answer to: Will SYRIZA MPs support the deal? The problem is that the sui generis nature of the leftist party means it is impossible to make any safe predictions about how its parliamentarians will behave, especially when the details of the settlement are not yet known. These two factors (SYRIZA’s unpredictability and the absence of an actual agreement) mean that all options – including Greece defaulting after rejecting a deal, the government holding a referendum to decide whether to accept further austerity in return for 7.2 billion euros of funding and the current parliament approving the content of whatever is agreed in Brussels – are open. The best that one can do at the moment is look for signals regarding how SYRIZA members and MPs might react to an agreement that, in all probability, will mean the government having to collect more revenues while slashing spending on pensions. Rarely has a meeting of SYRIZA’s central committee drawn as much attention as last weekend’s gathering, when the party’s Left Platform proposed that the government should draft “alternative plans” for Greece in case it is forced into a corner by lenders and presented with an agreement that goes against many of the leftists’ most important election pledges. In a fairly narrow vote, 95 central committee members voted against the proposal, while 75 supported it. There are two ways to read this (as is usually the case when SYRIZA is concerned). The first is to see a strengthening of the Left Platform’s resistance to a deal that would trigger new austerity measures. The group, which is led by Energy Minister Panayiotis Lafazanis, has only around 60 of the 201 seats on the central committee so it obviously drew support from elsewhere in Sunday’s vote. This interpretation, coupled with Lafazanis’s defiant rhetoric, suggests that many within SYRIZA believe the party will be asked to perform an about-turn and adopt the very policies it raged against for the last five years and they are not willing to accept this. If this reading is correct, then Tsipras will face an insurmountable task in getting any deal through parliament. Around 25 of SYRIZA’s 149 MPs belong to the Left Platform and if they all (or even half of them) vote against a deal, it would mean the government losing its majority (given that coalition partner Independent Greeks provide 13 seats). In turn, this would lead to a new coalition being formed from the current parliament or snap elections being called. The latter option seems far more likely. However, an alternative interpretation of the central committee’s proceedings is that the Left Platform voiced its concerns and flexed its muscles but ultimately did not undermine Tsipras. This is also borne out by Lafazanis’s behaviour over the last four months. While he has insisted that the government will not cross its “red lines”, particularly with regard to the privatisation of energy and other utilities (which relates to his portfolio), he has not criticised Tsipras or other ministers in connection with the ongoing negotiations. Lafazanis is clearly driven by his leftist ideology but has so far not given the impression of being the man who wants to bring the government down, especially as he played a part in Tsipras becoming party leader several years ago. There are also indications from the actions of other key players within SYRIZA that the party will make Tsipras’s life difficult but ultimately will not stand in his way. The prospect of early elections being held amid acrimonious disagreement within SYRIZA could lead to the Greek left blowing its only chance since the Second World War to govern virtually on its own (Independent Greeks being mostly a passenger on this ride). For example, outspoken parliamentary speaker Zoi Konstantopoulou courted more controversy this week for her 10-hour grilling of the would-be board members at ERT, the public broadcaster the government is about to reopen. While Konstantopoulou enraged even other SYRIZA MPs, after her intensive questioning she did not cast a ballot against the nominations, supported by Tsipras and his right-hand man, State Minister Nikos Pappas, but voted “present”. 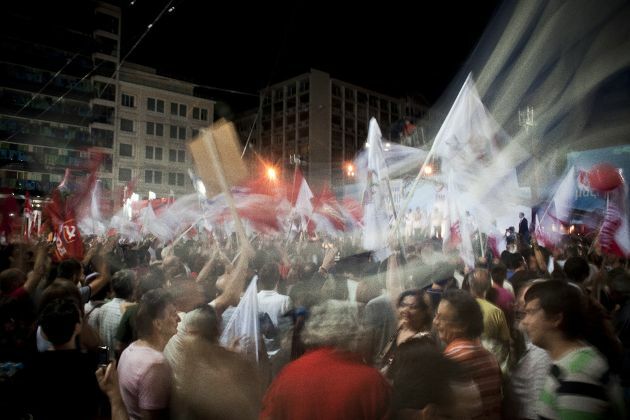 Since its creation, SYRIZA has been a political talking shop and there is a sense that the friction of the last few months has simply been a continuation of this perennial internal debate. Through this prism, Tsipras only has to worry about an agreement not being approved if it is deemed as having been shoved down Greece’s throat or if he fails to keep his part in the loop. Instead, if he is able to gain some concessions (for example, a lower primary surplus and the return of collective wage bargaining) and makes sure his party feels it is involved in the decision-making process, then the prime minister should be able to proceed without suffering too much collateral damage. This means there are two distinct ways of reading what is going on in SYRIZA right now. One suggests there is a very bumpy road ahead, while the other indicates that things can be smoothed over. Until we know the content of the agreement and how it has been arrived at, it is futile to predict with certainty which way SYRIZA will veer. If there is one thing that the leftist party excels at, it is being impossible to pin down. *You can follow Nick on Twitter: @NickMalkoutzis. This article appeared in last week's e-newsletter, which is available to subscribers online or via our free mobile apps (App Store and Google Play). Give me one good reason why they should? They are the clear winner of this pseudo negotiation. The winner dictates terms and not the loser.